Gold Shield Private Home Management is the preeminent private home management and property caretaking firm serving the New Jersey Shore. 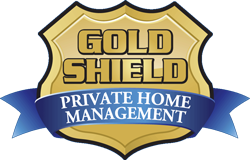 Founded by William B. Coyle, a retired twenty five year veteran of the Spring Lake Police Department, Gold Shield Private Home Management has the experience and skills to expertly and professionally manage any situation that may occur at your home while you are not in residence. Gold Shield Private Home Management will provide the absentee homeowner with unparalleled service that will exceed your expectations. We tailor our services to meet the individual needs and concerns of our clients. We strive to build one on one relationships with each and every homeowner. Gold Shield Private Home Management is driven by an adherence to protect what matters, to act in your best interest in every situation and to honor our commitment to provide you with the peace of mind that comes with employing a firm that is the benchmark in reliability, honesty, integrity and dedication. Professional care provided by Gold Shield Private Home Management will free you from unnecessary anxiety and worry while you are away allowing you to truly enjoy your time which will further enhance your life. Gold Shield Private Home Management will simplify your life by freeing you of the burdens of managing your home. Benjamin Franklin once said "Lost time is never found again." Why would you spend your precious time attending to the minutia of everyday life? Let Gold Shield Private Home Management do those things for you.